Stephane B. POUSSOU (N2000); Combustion technology and new business development at Air Products and Chemicals, Inc. When Exxon Mobil announced in 2009 its $41 billion acquisition of XTO Energy - Exxon Mobil's biggest takeover in a decade - unconventional U.S. natural gas came into the spotlight. Since then, large acquisitions of oil and gas assets in North America and consolidation in the oilfield services industry (e.g. BJ Services by Baker Hughes for $5.5 billion) have reshaped the U.S. petroleum industry as a whole. In the meantime, coal-fired power generation is facing mounting pressure from public and economic debate despite its ubiquity as the largest source of electricity. What triggered such a sudden and profound transformation of the U.S. energy landscape? Why are U.S. natural gas reservoirs capturing worldwide attention? How can obscure rocks in Pennsylvania influence energy policies in Poland? More than ever, innovation and technology are enabling the U.S. oil and gas industry, to reinvent itself through the use of a simple but potent extraction technique: horizontal fracturing. The term unconventional gas is typically associated with three types of geological formations: tight sands gas (low permeability sandstone or limestone), coalbed methane (coal) and shale gas (fine-grained sedimentary rock inter-bedded with siliceous and carbonaceous material). In conventional gas reservoirs (sandstone), the gas is stored within the rock matrix pore space and/or naturally occur-ring fracture networks; production relies on the permeability connecting the two. In unconventional gas reservoirs however, most of the gas is adsorbed at the surface of the organic-rich matter within the formation and does not readily come out because the fracture system is sealed. To extract this gas, operators introduce fractures into the formation to provide conductive flow channels and enhance desorption. 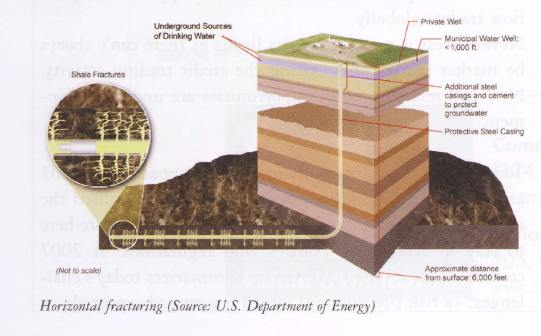 This stimulation process (referred to as `fracturing' or `fracking') relies on the injection of pressurized fluid (up to 10,000 psi, 700 bar) to break apart the rock aside the wellbore as well as granular material ('proppant') to prop the fractures open and release the gas. 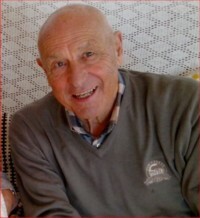 Shale fracturing was pioneered by petroleum engineer George Mitchell in 1981 in the Barnett shale (Texas). Although oil and gas production in shale plays was considered uneconomic at the time, his company persisted in developing the technique in vertical wells until its acquisition by Devon Energy in 2001. For the first time ever in 2002, Devon Energy combined horizontal drilling and hydraulic fracturing in the Barnett shale in order to take advantage of the horizontal nature of shale formations. Following this success, the horizontal fracturing technology has become an industry-wide practice for developing North American shale and other unconventional formations at commercially attractive levels. U.S. shale gas production grew by an average of 48% per year between 2006 and 2010, compared with 17% between 2000 and 2006. 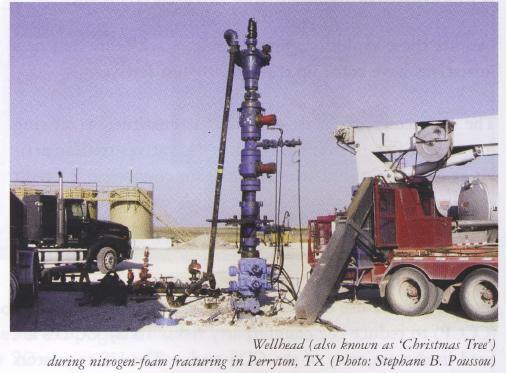 In practice, a well is drilled and mobile fracturing equipment (pumper trucks, proppant and additives handling units) is brought to the well pad by an oilfield services company for a period typically less than a week. The majority of wells are stimulated using hydraulic fracturing, which typically requires between 2 and 4 million gallons of water (7,500-15,000 cubic meters), of which only a third flows back to the surface. 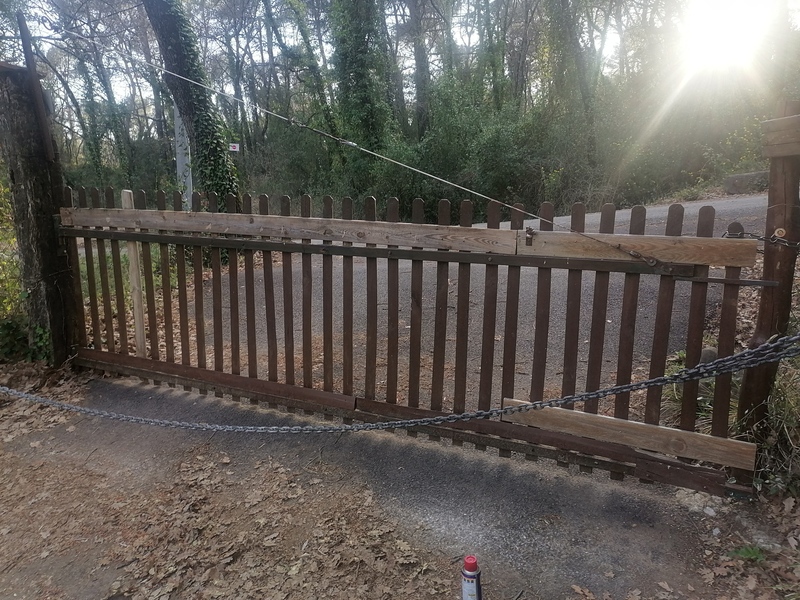 As an alternative to water, energized fluids (nitrogen or carbon dioxide mixtures) can be used when there is a need to minimize water footprint or treat water-sensitive or under-pressured formations. In addition, chemical additives (friction reducers, biocides, surfactants) are injected to improve fracturing efficiency and pumping performance. The fracturing process has significantly improved since its inception thanks to advances in drilling (horizontal wells now extend up to 5,000 ft, 1.5 km) and multi-stage fracturing technology, which allows targeting and isolating specific pay zones along the lateral section. 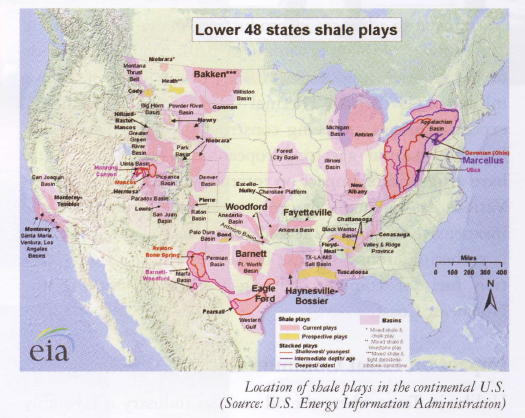 The United States are home to five major shale plays: Haynesville, Barnett, Fayetteville, Marcellus, and Woodford. The most widely known, the Marcellus shale, spreads across Pennsylvania and is the second largest natural gas field in the world. It gained Wall Street's favors almost overnight in 2008 when Professor Terry Engelder at Penn State University calculated that this formation could meet U.S. gas demand for decades (489 trillion cubic feet, or 20 years of U.S. consumption by most recent estimates). In comparison, the Energy Information Administration (EIA) estimated in its Annual Energy Outlook for 2011 that technically recoverable shale gas reserves in the U.S. which skyrocketed over the past decade may hold 827 trillion cubic feet (23.4 trillion cubic meters). Estimates are certain to change over time as new information is gained through drilling and production, as well as development of shale gas recovery technology. Overall, the wide distribution and quality of shale plays have allowed U.S. energy companies and oilfield operators to quickly learn, develop and perfect stimulation methods. Their technical leadership, know-how and operational experience are sought after by worldwide energy players to develop emerging shale plays (China, India, Poland, Argentina, etc. ), which has resulted in profound changes in the global energy equation. Today, natural gas accounts for 23% of total U.S. power generation (compared to 45% for coal) and hasb ecome increasingly more attractive than coal due to low prices and relatively lower capital construction costs. 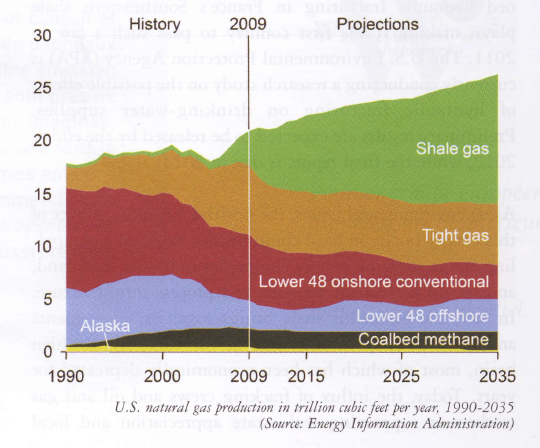 The EIA estimates that U.S. shale gas production (47% of total natural gas production in 2009) will continue to increase strongly through 2035, growing almost fourfold from 2009. Because shale gas offers a way not only to pro-duce cleaner energy, but also to sever U.S. dependence on foreign oil imports and offset declining energy supplies, future growth of the coal industry and carbon capture initiatives in the U.S. are faced with uncertainty. Few new central-station coal-fired power plants will be built in decades to come, beyond those already under construction or tied to clean coal incentives. In addition to advances in production, major initiatives are underway to develop natural gas utilization and provide necessary price support above the current level of $4 per million BTU (British Thermal Units). In the Gulf Coast, export terminals are being constructed to potentially ship liquefied natural gas to European markets, which could have a significant impact on international energy relations. Various gas-to-chemicals projects also seek to tap into the inexpensive and abundant feedstock. Moreover, momentum is gathering around the use of natural gas as a transportation fuel for commercial long-haul trucks serving the Northeast Coast. Unlike in Texas where the oil and gas industry is favorably accepted, the rapid development of the Marcellus shale in Pennsylvania and New York has been met with a wave of public concerns about ground water contamination by fracturing chemical additives, traffic of heavy-duty vehicles, road deterioration, etc. The environmental debate rippled all the way to France, where the government recently banned hydraulic fracturing in France's Southeastern shale plays, making it the first country to pass such a law in 2011. The U.S. Environmental Protection Agency (EPA) is currently conducting a research study on the possible effects of hydraulic fracturing on drinking-water supplies. Preliminary results are expected to be released by the end of 2012, while the final report is due in 2014. Aside environmental issues, the positive financial impact of this energy boom on local communities has been a compel-ling factor allowing energy companies to buy or lease land, and set up permanent pipeline and process infrastructure. In fact, the Marcellus shale brings royalties, investments and taxes directly to the heart of the rural Appalachian basin, most of which has been economically depressed for years. 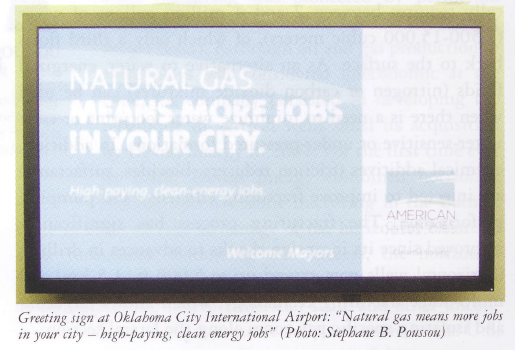 Today, the influx of fracking crews and oil and gas workers is supporting real estate appreciation and local businesses, as these jobs traditionally provide generous income and benefits (between $50k and $100k per year). Some predict that around 2025, at the expected peak of shale gas, Pittsburgh may become a new Dallas. Major energy and oilfield services companies have already set up local offices and equipment hubs near the sweet spot of the Marcellus located East of Pittsburgh. Another sign of the social impact of shale gas is the participation of leading U.S. universities (e.g. Marcellus Center for Outreach and Research at Penn State University) in shale gas initiatives, through conferences, research, and education on the various facets of this new economy. With the development of its shale gas assets, the U.S. industry is showing a capacity to quickly capitalize on innovation and leverage technology to accelerate growth, by aligning private sector, government agencies, and universities. Shale fracturing has revolutionized the U.S. oil and gas industry and unlocked reservoirs which had not been economically commercialized due to volatile natural gas prices for many years. In a period of economical uncertainty, the rapid creation of wealth through jobs and royalties, and the vitality of public and political debate around the national importance of shale gas have contributed to its increasingly widespread acceptance, even by audiences traditionally more inclined to coal-fired power generation. Such creation of value does not simply rely on the discovery of natural resources, but more on a dynamic entrepreneurial environment open to risk, from local `Mom-and-Pop' family-owned businesses to larger energy companies. In other words, the U.S. industry enjoys a cultural aptitude to see things through the lens of change, not for what they are, but for what they can be.